The National Institute for Occupational Safety and Health estimates that 22 million American workers are exposed to hazardous noise, with a third of those workers demonstrating measurable noise induced hearing loss (NIHL). Two types of hearing loss have been described following noise exposure. Permanent threshold shift (PTS) is an irreversible increase in hearing threshold due to loss of or changes in cochlear sensory cells and corresponding nerve fiber degeneration. In contrast, temporary threshold shift (TTS) is a relatively short-term transient loss of hearing that can resolve to a prenoise exposure level in minutes, hours, or days. However, in both TTS and PTS, the pattern of hearing loss varies depending on the differences in the noise paradigm to which they were exposed. Elucidation of the early molecular signatures that correspond to different levels of noise is a critical step in the prevention of NIHL. Meltser et al. compared changes in certain cochlear proteins following noise exposures to TTS levels (100 dB SPL for 45 min) and PTS levels (110 dB SPL for 2 h) in CBA/CaSca mice sampled at 30 min, 2 h, and 24 h postexposure. They found differences in three mitogen-activated protein kinases (MAPK) (ERK1/2, p38, and JNK1/2) between the acute phase of TTS and PTS: 24 h after exposure, the MAPK levels in TTS mice had not yet stabilized while it stabilized in PTS mice. In both exposures, brain-derived neurotrophic factor (BDNF) was elevated, but the elevation persisted only after PTS. BDNF's receptor TrkB was down-regulated only after PTS. Although these data suggest that TTS and PTS are linked to two distinct processes, the differences in the molecular responses were detected at a much later time point after noise exposure. Since early intervention is crucial to the prevention of NIHL, it would be important to evaluate the molecular responses immediately after noise exposure, especially at intensities that are capable of inducing different levels of PTS. Protective factors against NIHL implicate three contributors to noise-induced loss and hearing damage: Reactive oxygen species (ROS), intracellular stress apoptotic pathways, and excitotoxicity due to glutamate neurotransmission. For ROS, Henderson et al. has hypothesized that the mechanism of PTS is dependent upon necrotic and signaled cell death generated by free-radical damage. In animal models, cochlear treatment with both exogenous and endogenous forms of anti-oxidants such as R-N6-phenylisopropyladenoisine,  glutathione,  N-L-acetylcysteine, creatine,  tempol,  and vitamin C  have been reported to be protective against PTS in preexposure and postexposure regimens. Similarly, blockade of intracellular stress pathways such as c-Jun N-terminal kinase and induction of heat shock protein Hsp70 have been shown to be protective against noise-induced cell death. , Another hypothesis is that the excessive noise leads to glutamate excitotoxicity: Caroverine (a glutamate receptor antagonist) and riluzole (a glutamate release blocker) have also been efficacious in preventing cell death and subsequent hearing loss. , Despite these advances, however, therapies aimed at molecular targets linked directly to different patterns of NIHL remain to be developed. While microarray analysis can provide clues into the regulatory pathways controlling NIHL, a relative paucity of studies has evaluated global gene expression in the period immediately following noise exposures. , Understanding the early molecular events that led to a shift in hearing threshold may provide insights toward the development of targeted therapeutic interventions against NIHL. Therefore, the purpose of this study was to look at gene expression immediately after noise exposure that induces different levels of hearing loss. [Figure 1] provides a schematic diagram of the experimental procedure used in this report. The study used 72 4-8-week-old female CBA/CaJ inbred mice (Jackson Laboratories, Bar Harbor, ME, USA). Animal procedures were approved by the University of Cincinnati Institutional Animal Care and Use Committee. The animals were housed, and all procedural activities were conducted in an Association for Assessment and Accreditation of Laboratory Animal Care accredited facility at the University of Cincinnati adhering to Laboratory Animal Medical Services policies and guidelines. The mice were randomly divided into three groups exposed to no noise (control), exposed to 110 dB SPL, or exposed 116 dB SPL broadband noise for 1 h. The acoustic system consisted of a General Radio (Concord, MA, USA) Type 1310 random noise generator whose output signal was controlled by a Mackie (Loud Technologies Inc., Woodinville, WA, USA) mixer amplifier. The output was amplified by a Soundcraftsman ® 4X300 Power Amplifier (Santa Ana, CA, USA), a single channel of which drove four Realistic super-tweeters (Radio Shack Corp, Ft. Worth, TX, USA, #40-1310B) built into the removable noise chamber cover. A graph of the one-third octave analysis of the broadband noise has been presented elsewhere. It is virtually flat between 8 and 20 kHz. Calibration and monitoring of the noise level inside the chamber was performed by a Sennhauser MKE 2-3 electret microphone whose input was displayed and analyzed on a Brüel & Kjær 2608 Measuring Amplifier. Microphone calibrations were confirmed preexposure and postexposure by a G.R.A.S. 42AB Sound Level Calibrator (Holte, Denmark). Immediately following noise exposure, the mice were anesthetized with an overdose of tribromoethanol (Avertin). Temporal bones were immediately dissected from the skull. The cochlea was isolated and cleaned of bone and soft tissue under a dissecting microscope. RNALater ® (Ambion Inc., Austin, TX, USA) was continuously applied over the inner ear. The cochleae were stored in 1.8 mL capped centrifuge tubes filled with RNALater ® at ambient temperature, placed in an insulating container and shipped overnight to the Alagramam Laboratory. To conduct the experiment in triplicate, a total of 72 mice in three batches were used. Each batch consisted of 24 mice: 8 mice for 116 dB exposure, 8 mice for 110 dB exposure, and 8 mice for 0 dB (control). The mice exposed to noise for 1 h were sacrificed immediately, and the cochlear tissue was harvested. Cochleae from each exposure sub-group (116, 100 or 0 dB exposure) were pooled together in a ratio of 0.75 mL of Trizol (Invitrogen, Carlsbad CA, USA)/50 mg of sample. A pellet pestle (Kimble-Chase, Vineland, NJ, USA) was used to homogenize the samples. The resulting homogenate was incubated at room temperature for 5 min. Chloroform was then added to the mix at a ratio of 0.2 mL/0.75 mL of Trizol to induce phase separation. Samples were mixed by manually inverting the tube for 15 s, and incubated for 15 min at room temperature. The samples were centrifuged at 12,000g for 15 min at 4°C and the aqueous phase containing the total RNA was removed. RNA was precipitated from the aqueous phase through the addition of 0.5 mL isopropyl alcohol per 0.75 mL of Trizol. Samples were incubated at room temperature for 10 min and centrifuged at 12,000g for 10 min at 4°C. The RNA pellet was washed in 75% ethanol by vortexing and centrifuged at 7500 g for 5 min at 4°C. After a brief air-dry, the RNA was resolubilized in RNAase free water. Total RNA samples were further purified using an RNeasy Mini Kit (Qiagen Co., Chatsworth, CA, USA). Final samples from each exposure sub-group yielded between 0.75 and 1.75 μg/μl of total RNA. An aliquot of the samples was retained for further quantitative real-time polymerase chain reaction analysis, and the rest was forwarded to the Affymetrix Resource Facility at Yale University (http://ycga.yale.edu/index.aspx) for microarray hybridization. Total RNA received by the Affymetrix Resource Facility was analyzed for quantity and purity. Absorbance ratios, measured by Nanodrop (Wilmington, DE, USA), were used to assess the amount and quality of the samples (2.1 ≥ A260/280 ≥ 1.8 and A260/230 ≥ 1.8). Further quality control was conducted with an Agilent 2100 Bioanalyzer (Foster City, CA, USA), which was used to score the RNA samples via an RNA Integrity Number (RIN). Measurements from the Nanodrop and Bioanalyzer (RIN >8) ensured the quality of RNA used for microarray hybridization. As described by the manufacturer, the Affymetrix Mouse Genome 430 2.0 Array (Santa Clara, CA, USA) contains an excess of 45,000 probe sets, with >34,000 characterized genes represented. In the present study, nine 430 arrays were used with each of the three exposure groups (control, 110 dB SPL, 116 dB SPL) performed in triplicate. Each array represents the pooled contribution of eight mice. Hybridization, washing, staining, and scanning of the 430 2.0 GeneChip were performed in accordance with the protocol outlined in the Affymetrix GeneChip Expression Analysis Technical Manual ver. 5 (Santa Clara, CA, USA). Briefly, 5 μg total RNA from each exposure experiment was reversed transcribed with Oligo (dT) primers generating first strand cDNA. First strand cDNA was used to generate double-stranded cDNA, which in turn was used as a template for the production of biotin labeled complementary RNA (cRNA) in an in vitro transcription reaction. About 20 μg of biotin-labeled cRNA was fragmented and later added to a hybridization cocktail used in a 16 h incubation. Washing, staining, and scanning steps were coordinated via the GeneChip Operating Software (GCOS) program (Santa Clara, CA, USA). Wash and stain steps were performed with an Affymetrix Fluidics Station 450. Scanning was performed using the Affymetrix GeneChip 3000 7G Scanner. The converted digital intensity signals were captured as a raw image file (.dat) and further refined by GCOS (.cel files). Differentially expressed genes, as determined by the Benjamini-Hochberg analysis, were entered into a gene-ontology/pathway analysis tool: DAVID [Database for Annotation, Visualization and Integrated Discovery]. As of this writing, DAVID (http://david.abcc.ncifcrf.gov/) is freely available online. The enriched list from the previous microarray data analysis was entered into the program, which queried the entered list, looking for the annotations (e.g., gene ontology [GO] terms, pathways) that were enriched in comparison to what would be expected relatively to the background. The background was set to the entire genome-wide genes relevant to Mus musculus. DAVID's functional annotation chart module uses a modified Fisher's exact test (EASE score) to calculate gene-enrichment for a particular annotation. An EASE score is modified in the sense that it removes one gene from a category of interest and calculates Fisher's exact test with the remaining queried genes. By removing one gene, annotations with few gene members are greatly penalized, while slightly handicapping more robust annotations. This conservative approach allows ruling-out of less significant annotations due to false positive members. A smaller EASE score indicates greater enrichment, with a cutoff of ≤0.05 indicating significant enrichment. 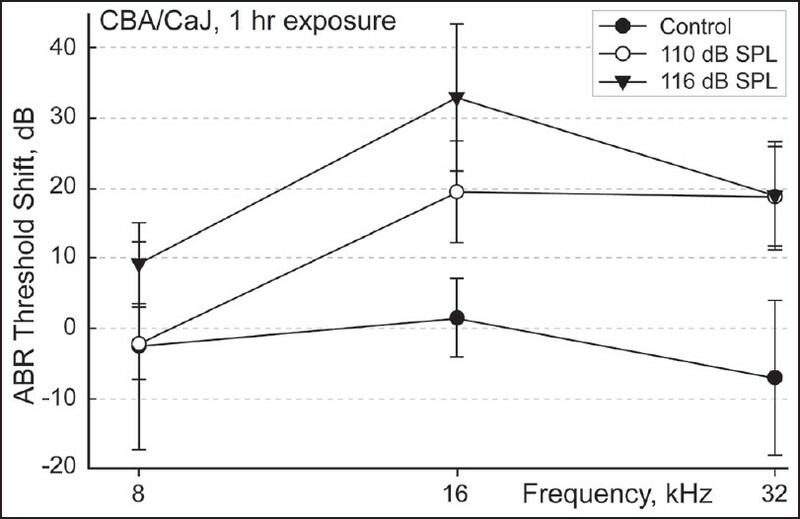 In this study, 4-8-week-old CBA/CaJ mice were exposed to two different noise conditions (116 dB SPL and 110 dB SPL) for 1 h, and to no noise (0 dB or control). Before proceeding with the main experiment (described below), we used a separate batch of CBA/CaJ mice to confirm that exposure to broadband noise at 110 and 116 dB SPL for 1 h results in ABR threshold shifts. The hearing loss induced by 116 dB SPL was 10-15 dB higher than that induced by 110 dB SPL noise exposure [Figure 2]. For the main experiment, immediately following noise exposure, the whole cochleae from each exposure group were harvested, and total RNA extracted for microarray hybridization and qPCR. Both microarray hybridization studies and qPCR analysis were performed in triplicate for each exposure. 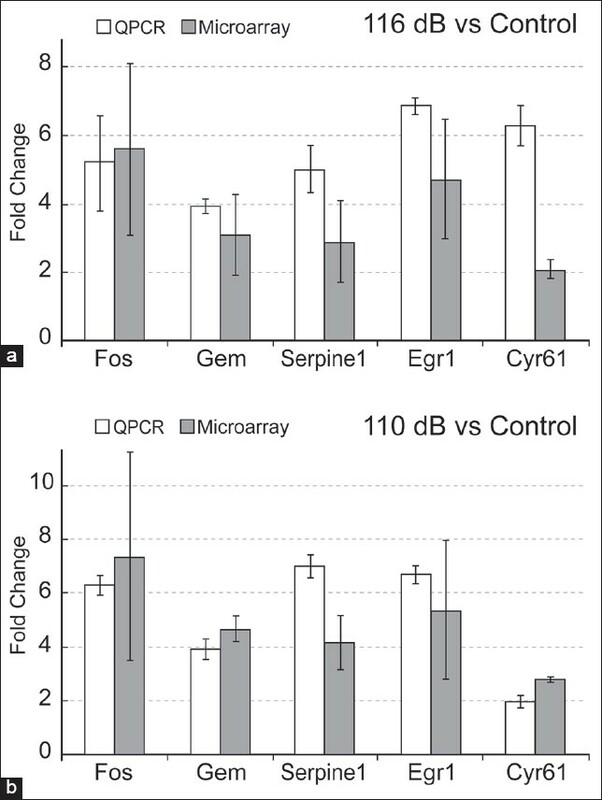 ANOVA analysis of the microarray data returned a relative FC and P value for each comparison (116 dB SPL vs. control, and 110 dB SPL vs. control). Enriched datasets were identified on the basis of FC and Benjamini-Hochberg analysis (FDR = 0.15-0.17). The differences in gene expression immediately following 1 h of 116 dB SPL noise exposure versus no noise exposure (116 vs. control) were compared. After applying Benjamini-Hochberg analysis (FDR = 0.15) and FC cutoff 1.2 to the microarray data, 243 genes were found to be up-regulated and 61 probes down-regulated. A volcano plot visualizes the probes that were ruled in for further study [Figure 3]a. 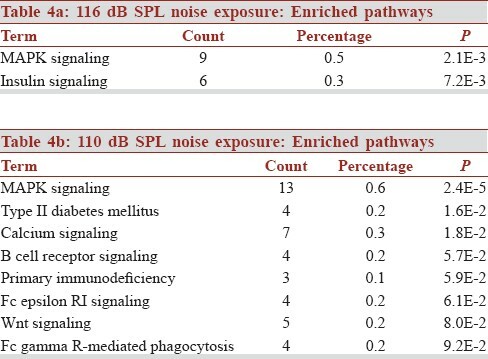 Both previously studied genes and novel genes not previously reported were found in the data set [Table 2]a and [Table 3]a. Pathway analysis indicated the enrichment of MAPK signaling and insulin signaling pathways in the cochlear response to 116 dB SPL noise exposure [Table 4]a. Nine MAPK signaling genes, which include Fos, Jun, Dusp1, Dusp14, Dusp5, Dusp6, Gadd45g, Nr4a1, and Srf, were up-regulated. Subsequent clustering analysis of GO terms relating to molecular function shows enrichment of the GO term "MAPK phosphatase activity" [Table 5]a. To evaluate the changes that occur in 110 dB SPL noise exposure, gene expression immediately following 1 h noise exposure at 110 dB SPL was compared with control (110 vs. control). A total of 155 probes were found to be up-regulated and 221 down-regulated. Regulated probes included both novel and previously studied genes [Table 2]b and [Table 3]b. 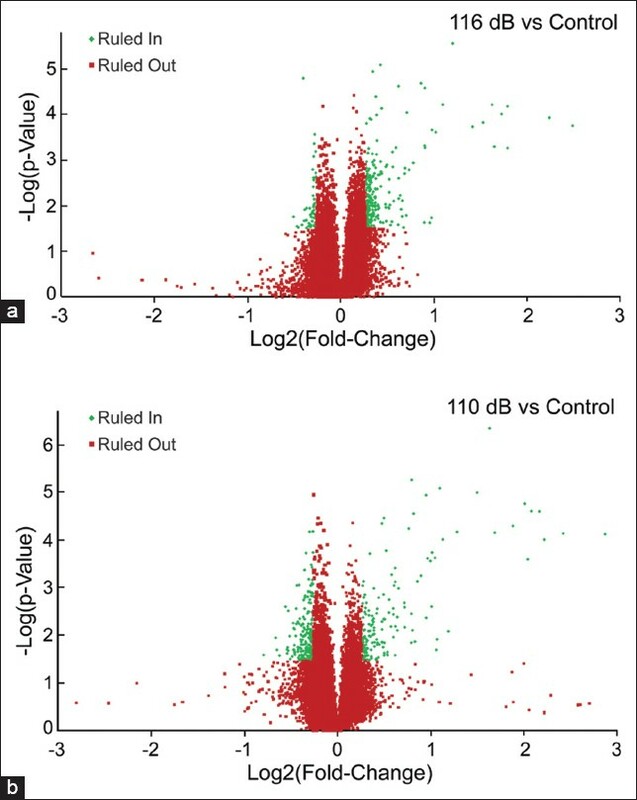 The greater inclusion of down-regulated probes is apparent on the volcano plot [Figure 3]b. Pathway analysis indicated the enrichment of MAPK signaling and seven other pathways in the cochlear response to 110 dB SPL noise exposure [Table 4]b. Clustering of GO terms relating to molecular function are enriched for (1) MAPK activity, (2) carbohydrate binding and (3) phosphatase activity [Table 5]a. A subset of genes from the enriched data sets was selected for verification by qPCR. 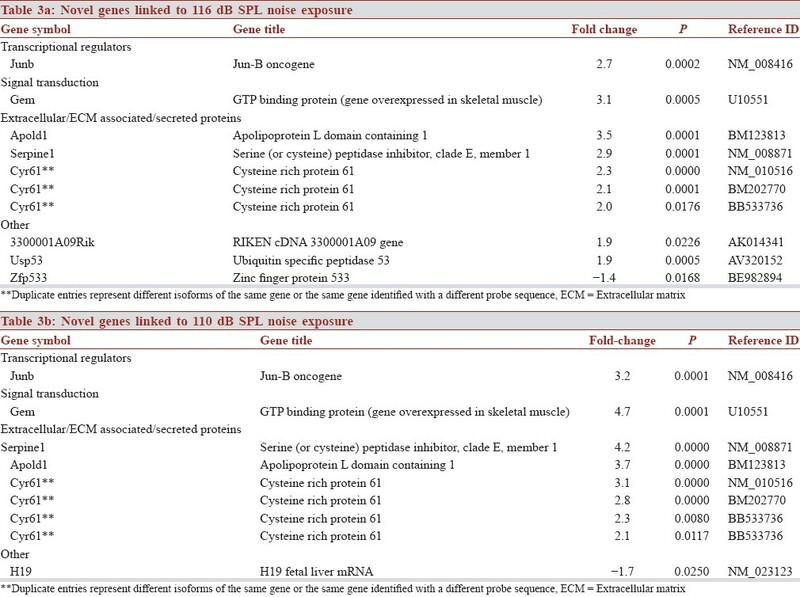 Genes selected for qPCR analysis included both novel genes (Gem, Serpine1, Cyr61, H19, Ntn1, IgJ) and genes previously identified in microarray studies following noise exposure (Fos, Egr1, Mt1). Good correlation was observed between the microarray and qPCR, as both methods showed consistent up-or down-regulation of selected genes [Figure 4]a and b. Out of the 14 comparisons verified via qPCR, one comparison (using IgJ primers) showed a significant difference in FC expression relative to its microarray counterpart. IgJ showed 3.9 times greater down-regulation (9.3-FC vs. 2.4-FC) via qPCR than in microarray studies. Since qPCR is a sensitive technique, a greater FC detected with qPCR compared with microarray hybridization for a specific gene is not surprising. Finally, since we carried out a genome-wide search, we wanted to examine whether the differentially expressed genes in our study were clustered to any specific chromosomes or if any loci had a high density of these genes. 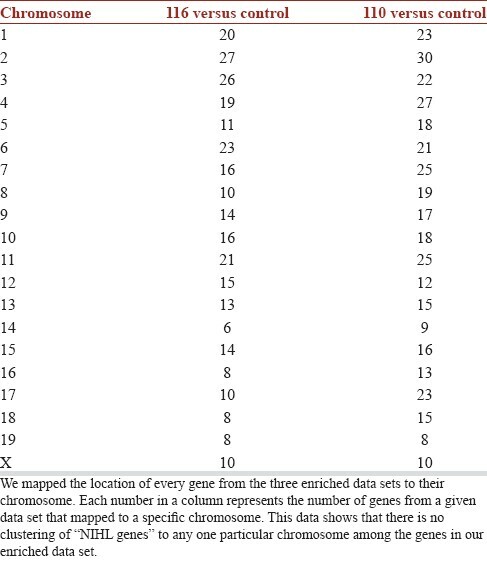 We mapped the location of each gene to its chromosome and found that there was no predilection to any one particular chromosome among the genes in our enriched data set [Table 6]. Here, we present the first report of gene expression changes in CBA/CaJ mouse cochleae immediately following 1 h of noise exposure. Our study demonstrates that the activation of MAPK signaling is already present at this early time point in the mouse model. 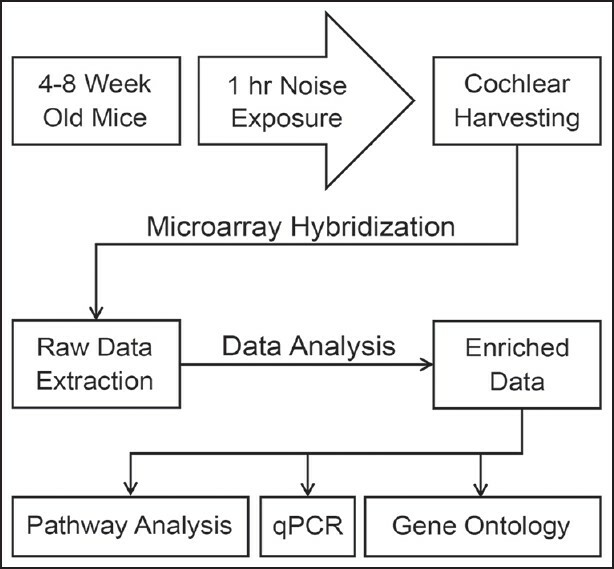 Good correlation between microarray and qPCR data validates the results obtained from global gene expression profiling of cochlear RNA after noise exposure as both methods showed consistent up- or down-regulation of all selected genes. The data presented here reveal a novel set of transcripts linked to early responses to noise exposure. This study provides further evidence that despite the activation of common signaling pathways, subtle differences in distinct transcriptomes differentiate the degree of hearing loss after different levels of noise exposure. Interestingly, both levels of noise exposure appear to activate the MAPK signaling pathway to induce hearing loss, which is in agreement with the previous reports. ,, The observations of this study further suggest that, irrespective of the differences in the noise levels MAPK signaling is potentially a common and critical mediator in NIHL. Nevertheless, subtle differences were detected in the expression of some transcriptomes, even though the modulation of many of the signaling proteins in this pathway was similar in both levels of noise exposure. More importantly, the functional implications of the observed quantitative and qualitative differences are consistent with the corresponding differences in the pattern of hearing loss. For example, the noise-induced increases in the expression of Fos, which has been implicated in neuronal apoptosis and cell death, , was relatively lower in animals exposed to 110 dB SPL. This probably limits the hearing loss to a lower level than that observed with 116 dB SPL, in which the hearing threshold was 10-15 dB higher. In addition, the differential expressions of distinct MAPK signaling transcriptomes that facilitate a survival response also correspond with the levels of hearing loss. Particularly, genes that encode calcium channel proteins Cacna1b and Cacna1g and a calcium-independent phospholipase Pla2g6 were down-regulated at lower levels of noise exposure but were not altered at higher levels. Down-regulation of these genes in the cochlea might be part of the endogenous mechanism that is protective against low-level noise exposure. Noise exposure has been reported to favor the entry of calcium into the sensory cells, which in turn facilitates hearing loss. The down-regulation of these genes could negatively impact this mechanism and contribute to the relatively lower levels of hearing loss observed at lower exposure levels. Taken together, these observations indicate that, despite the activation of common signaling pathways, the differential expression of distinct transcriptomes in MAPK signaling could determine the differences in the pattern of hearing loss after different levels of noise exposure. One important question relevant to the mechanism of NIHL is, "Which cell type(s) within the cochlear duct show differential expression or changes in specific signaling pathways?" Since the global expression study was carried out using whole cochlear tissue, it is not possible to assign cell type specific changes in gene expression or cell specific signaling pathways. One of the goals of a future study will be to investigate cell type specific changes in gene expression with a special focus on hair cells, support cells, ganglion cells and cells of the stria vascularis. The partial overlap of our data set to previous noise exposure studies from other laboratories and those transcripts showing the same trend (up- or down-regulated) [Table 2] reveals several important points: First, irrespective of the animal model (mouse, chinchillas or guinea pigs), the type of noise exposure (TTS, PTS or impulse noise), or the duration of exposure to noise and/or the postexposure duration before tissue harvest, ,, our analysis reveals that a set of genes linked to transcriptional regulation, oxidative and inflammatory stress response and cell cycle/differentiation are up-regulated following noise exposure. In contrast, using a similar comparison to differential gene expression profiles in the salicylate ototoxicity of the mouse,  we found only two transcripts that overlapped with our data set. 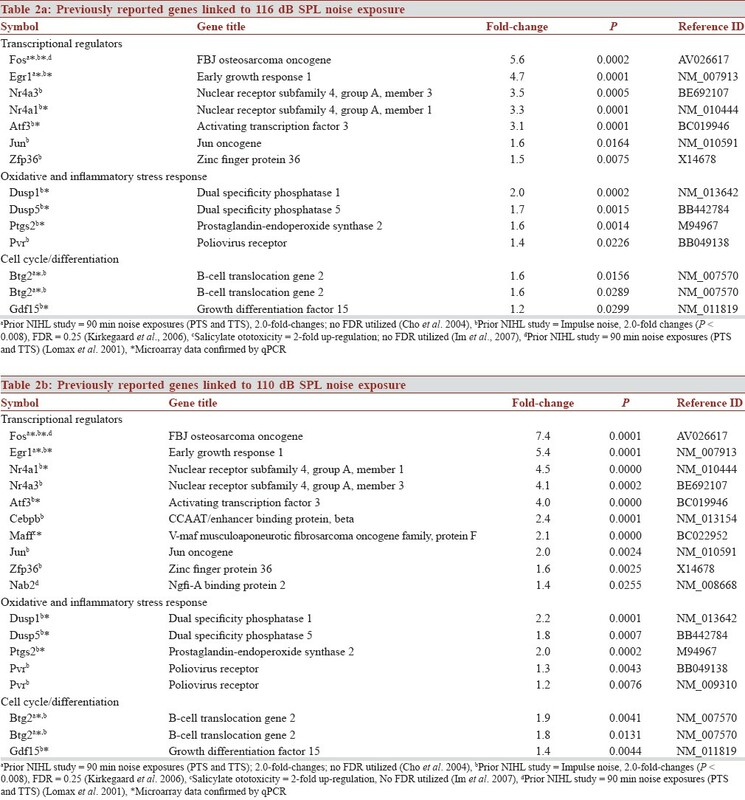 We propose that those genes noted in [Table 2] are early-common responders to noise exposure and thus, generic biomarkers for noise exposure. Second, the cross-species consensus noted above suggests that a similar response is likely in humans following noise exposure. Third, noise exposure induces oxidative stress within an hour of exposure. Fourth, partial overlap of transcripts to previously reported studies noted above validates the methodology used to study the consequences to noise exposure at the molecular level. In summary, different levels of acoustic over-stimulation result in profound changes in numerous common and divergent molecular pathways in as little as 1 h. We know that these pathways play important roles in tissues and organs outside of the ear. Thus, to interfere with the processes leading to different levels of threshold shifts, and therefore, rescue noise-damaged hearing, careful and targeted regulation of these metabolic pathways will be required. By better understanding the metabolic milieu of the noise-exposed ear, we hope to positively impact the current epidemic of NIHL. This work was supported by a grant (R21-DC07866) from the NIH to K.N.A. This work was carried out with the assistance of Nam Kim and David A. Custer; we appreciate their help and input. Tak S, Davis RR, Calvert GM. Exposure to hazardous workplace noise and use of hearing protection devices among US workers - NHANES, 1999-2004. Am J Ind Med 2009;52:358-71. Meltser I, Tahera Y, Canlon B. Differential activation of mitogen-activated protein kinases and brain-derived neurotrophic factor after temporary or permanent damage to a sensory system. Neuroscience 2010;165:1439-46. Bodmer D. Protection, regeneration and replacement of hair cells in the cochlea: Implications for the future treatment of sensorineural hearing loss. Swiss Med Wkly 2008;138:708-12. Henderson D, Bielefeld EC, Harris KC, Hu BH. The role of oxidative stress in noise-induced hearing loss. Ear Hear 2006;27:1-19. Henderson D, McFadden SL, Liu CC, Hight N, Zheng XY. The role of antioxidants in protection from impulse noise. Ann N Y Acad Sci 1999;884:368-80. Walker MW, Kinter MT, Roberts RJ, Spitz DR. Nitric oxide-induced cytotoxicity: Involvement of cellular resistance to oxidative stress and the role of glutathione in protection. Pediatr Res 1995;37:41-9. Duan M, Qiu J, Laurell G, Olofsson A, Counter SA, Borg E. Dose and time-dependent protection of the antioxidant N-L-acetylcysteine against impulse noise trauma. Hear Res 2004;192:1-9. Minami SB, Yamashita D, Ogawa K, Schacht J, Miller JM. Creatine and tempol attenuate noise-induced hearing loss. Brain Res 2007;1148:83-9. McFadden SL, Woo JM, Michalak N, Ding D. Dietary vitamin C supplementation reduces noise-induced hearing loss in guinea pigs. Hear Res 2005;202:200-8. Pirvola U, Xing-Qun L, Virkkala J, Saarma M, Murakata C, Camoratto AM, et al. Rescue of hearing, auditory hair cells, and neurons by CEP-1347/KT7515, an inhibitor of c-Jun N-terminal kinase activation. J Neurosci 2000;20:43-50. Ehrenberger K. Clinical experience with caroverine in inner ear diseases. Adv Otorhinolaryngol 2002;59:156-62. Ruel J, Wang J, Pujol R, Hameg A, Dib M, Puel JL. Neuroprotective effect of riluzole in acute noise-induced hearing loss. Neuroreport 2005;16:1087-90. Cho Y, Gong TW, Kanicki A, Altschuler RA, Lomax MI. Noise overstimulation induces immediate early genes in the rat cochlea. Brain Res Mol Brain Res 2004;130:134-48. Kirkegaard M, Murai N, Risling M, Suneson A, Järlebark L, Ulfendahl M. Differential gene expression in the rat cochlea after exposure to impulse noise. Neuroscience 2006;142:425-35. Davis RR, Kuo MW, Stanton SG, Canlon B, Krieg E, Alagramam KN. N-Acetyl L-cysteine does not protect against premature age-related hearing loss in C57BL/6J mice: A pilot study. Hear Res 2007;226:203-8. Erway LC, Shiau YW, Davis RR, Krieg EF. Genetics of age-related hearing loss in mice. III. Susceptibility of inbred and F1 hybrid strains to noise-induced hearing loss. Hear Res 1996;93:181-7. Wu Z, Irizarry RA, Gentleman R, Murillo FM, Spencer F. A Model Based Background Adjustment for Oligonucleotide Expression Arrays. Working Papers, Department of Biostatistics, Johns Hopkins University; 2004. Fisher RA. Statistical Methods for Research Workers. Edinburgh, London: Oliver and Boyd; 1925. Benjamini Y, Hochberg Y. Controlling the false discovery rate - A practical and powerful approach to multiple testing. J R Stat Soc Series B Methodol 1995;57:289-300. Lomax MI, Gong TW, Cho Y, Huang L, Oh SH, Adler HJ, et al. Differential Gene Expression Following Noise Trauma in Birds and Mammals. Noise Health 2001;3:19-35. Im GJ, Jung HH, Chae SW, Cho WS, Kim SJ. Differential gene expression profiles in salicylate ototoxicity of the mouse. Acta Otolaryngol 2007;127:459-69. Dennis G Jr, Sherman BT, Hosack DA, Yang J, Gao W, Lane HC, et al. DAVID: Database for Annotation, Visualization, and Integrated Discovery. Genome Biol 2003;4:P3. Hosack DA, Dennis G Jr, Sherman BT, Lane HC, Lempicki RA. Identifying biological themes within lists of genes with EASE. Genome Biol 2003;4:R70. Zhao S, Fernald RD. Comprehensive algorithm for quantitative real-time polymerase chain reaction. J Comput Biol 2005;12:1047-64. Jamesdaniel S, Hu B, Kermany MH, Jiang H, Ding D, Coling D, et al. Noise induced changes in the expression of p38/MAPK signaling proteins in the sensory epithelium of the inner ear. J Proteomics 2011;75:410-24. Maeda Y, Fukushima K, Omichi R, Kariya S, Nishizaki K. Time courses of changes in phospho- and total-MAP kinases in the cochlea after intense noise exposure. PLoS One 2013;8:e58775. Ye X, Meeker HC, Kozlowski P, Carp RI. Increased c-Fos protein in the brains of scrapie-infected SAMP8, SAMR1, AKR and C57BL mice. Neuropathol Appl Neurobiol 2002;28:358-66. Mikula M, Gotzmann J, Fischer AN, Wolschek MF, Thallinger C, Schulte-Hermann R, et al. The proto-oncoprotein c-Fos negatively regulates hepatocellular tumorigenesis. Oncogene 2003;22:6725-38. Minami SB, Yamashita D, Schacht J, Miller JM. Calcineurin activation contributes to noise-induced hearing loss. J Neurosci Res 2004;78:383-92.